Located in the southern most portion of Kootenay National Park, overlooking the Village of Radium Hot Springs, Redstreak Campground has a magnificent view of the Columbia Valley and Purcell Mountains. Redstreak Campground is a 242-site campground providing a variety of amenities including full hook up, semi and non-serviced sites, as well as ten oTENTik tent cabins that can be rented on a nightly basis. In the Summer months participate in daily interpretive programs at Redstreak Campground, enjoy a gentle hike to the hot springs, or take a stroll through the Village of Radium Hot Springs. Don’t forget your camera, Bighorn sheep are often seen wandering through Redstreak Campground and adjacent restoration area! A 1.8 km trail connects Redstreak Campground with the restaurants, and services in the village. A separate 2.7 km trail leads to the Radium Hot Springs Pools. The Redstreak Campground registration kiosk is open from 7:30 a.m. to 10:00 p.m. If you arrive after hours, please check the white board for your site assignment and register in the morning at the kiosk. In addition to the services above, Redstreak Campground also offers kitchen shelters, fire rings and firewood, smoke-free areas, playgrounds, walking trails, recycling bins, food storage, and a public telephone. A 1.8 km trail connects Redstreak Campground with the restaurants, and services in the village, this is known as the Valley View Trail. A separate 2.7 km trail leads to the Radium Hot Springs Pools. You can also access the Redstreek Loop Trail as well as Redstreak Restoration Trail right from the campground. 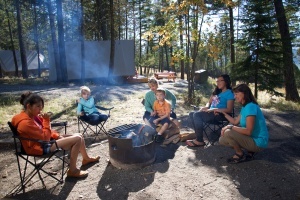 McLeod Meadows, set in the centre of Kootenay National Park, is the perfect secluded sanctuary for families looking to unplug. Listen to the sound of the Kootenay River and watch for wildlife, including deer and elk. Enjoy a gentle hike to Dog Lake then take a short trip down the highway to the Village of Radium for dinner and a soak in the hot pools.